Tom went through a rough ride to arrive at the proposal. They lost their connecting flight due to an airline delay. Luckily we were able to reschedule to the following day but into a night time photo session. To make things more interesting a rainstorm was about to drop-in in Rome. Denominated: ‘the water bomb’. Over the phone we fought the hesitation of calling it off and played out the all or nothing card. Let’s do it! Rain or no rain. 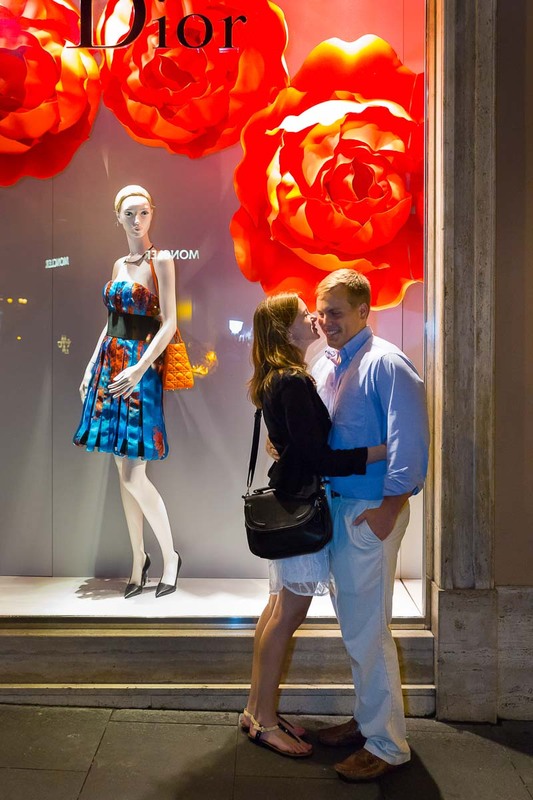 Meeting at 10:00 pm at the Spanish Steps. I arrived just in time because the roads were not fully accessible due to the ‘water bomb’. There was little time left to find the right spot. I choose the one you see in the pictures as it was the best mixture between available street light and scenic view. I ruled out using flash and tried capturing the moment exactly as it happened trying to use my most luminous lens. I photographed at a distance keeping an eye on the people that could potentially enter the frame. I saw lights spark in their faces. A mixture of surprise, happiness and relief. My heart really goes out for them and this wonderful union. 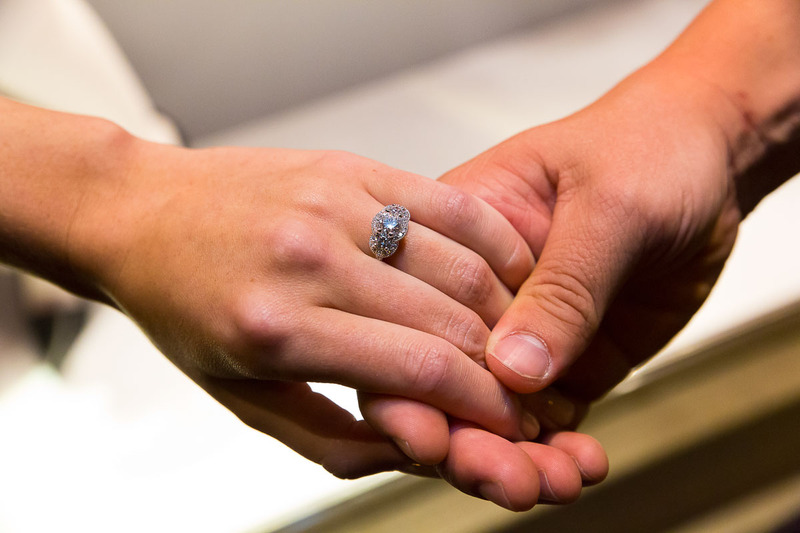 Some obstacles had to be overcome and I am truly happy for them. The rest was downhill. The joy of the moment and the bubbles carried us through the engagements pictures which followed. Took us down the stairs to the Spanish steps. First we jumped in via Condottti in Rome. Taking pictures in the middle of the street while trying to find some good street light. 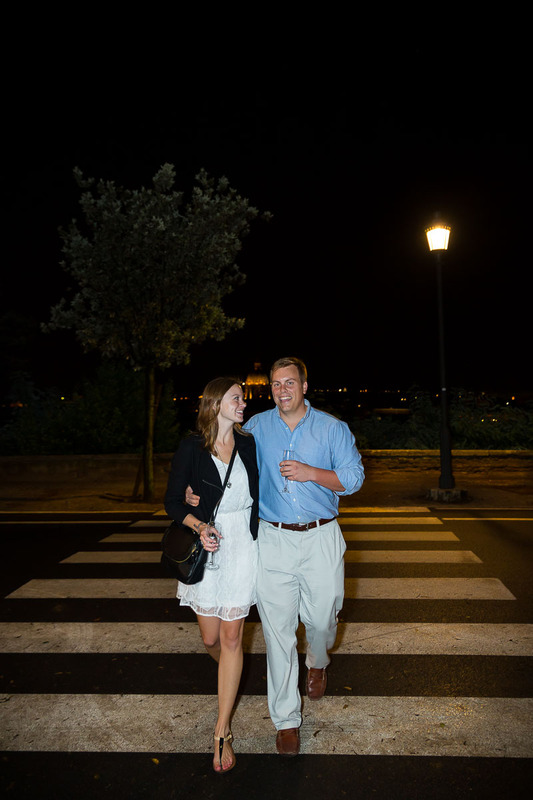 Then it was up towards Parco del Pincio where we photographed along the way and underneath street lights. 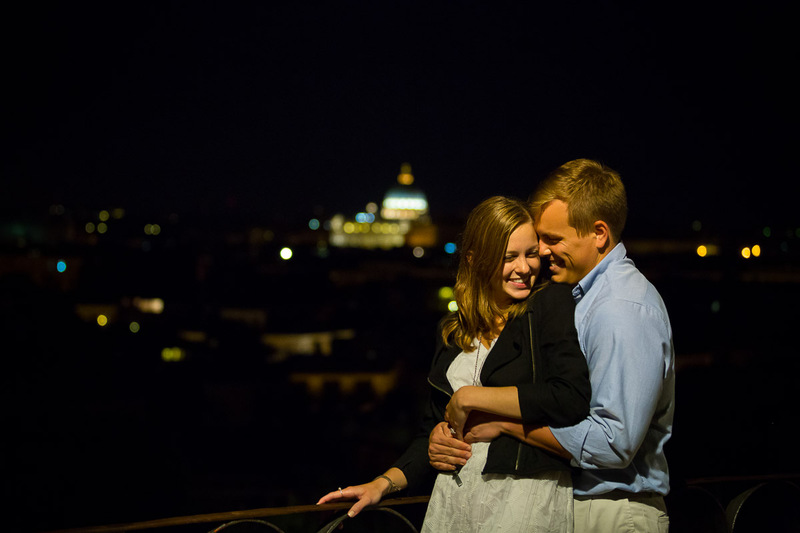 When we reached the terrace view we took some final pictures with the stunning view of the roman rooftops at night. 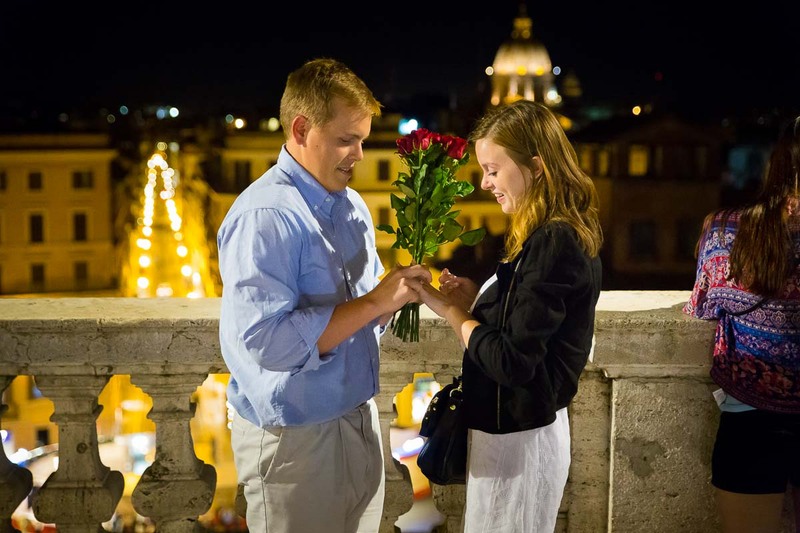 Check out the Wedding Proposal Rome page for more details. 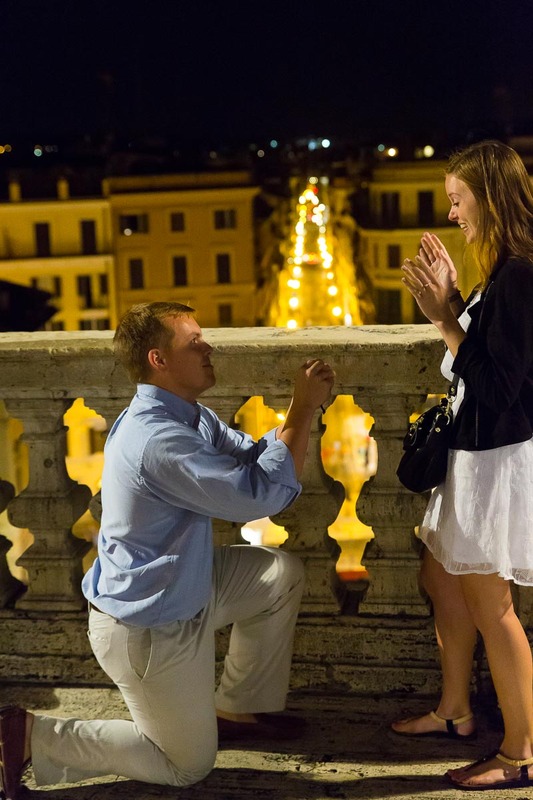 An inspiring surprise wedding proposal photographed here in Rome at the Spanish steps. 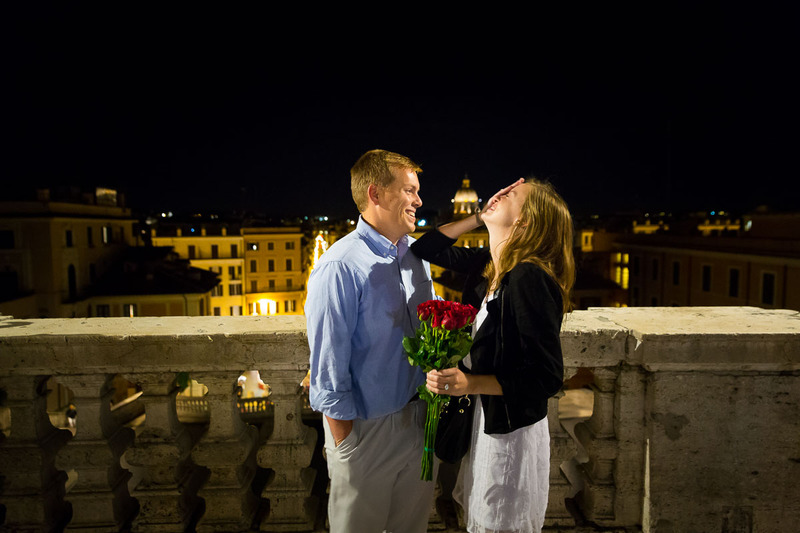 Following with a beautiful engagement session at Parco del Pincio.